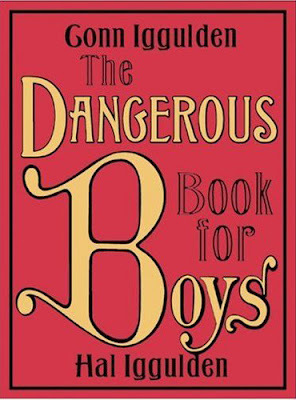 Over half a million copies of this have been sold in Britain, and small animals here in the US are now officially terrified: "(this) book teaches (boys) to do things like shoot and skin a rabbit...and build slingshots." In other words, back to the good old days, and thus the old timey cover. I'm guessing it's not nearly so pink in real life? I like the simplicity of this cover. I really enjoy the old-tymey cover, but does anyone else wonder if this will really resonate with the audience they're aiming this at? If I was a ten-year old boy who liked making trouble, and I unwrapped this as a Christmas present, I probably wouldn't even bother cracking it open once. I understand the relevance, but I don't think the young boys will. Do I get points for finding the type inspiration for this? An 1890 manual that is still in print.